Sharlotka or zapekanka? You will find out at the end of the article. The ‘Sharlotka’ or warm traditional Russian apple cake is a variation of the ‘Charlotte’ and tastes just as good, but has a rather unappetizing name in the Book. I thought I’d treat myself to cake for breakfast this week. I justified the temptation because the cake has a name like ‘zapekanka’, and no dessert should have such an unappealing name, and because the cake is much like French toast with apples, universally acceptable as breakfast food. 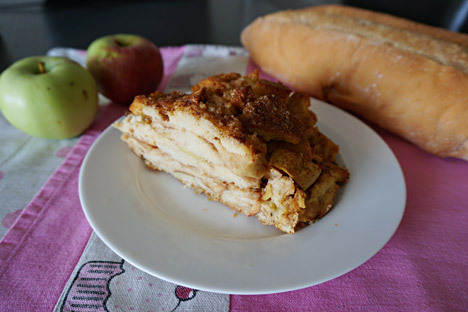 In the traditional book the dish is called “apple and white crouton bake” (‘zapekanka’) and is found in the “old recipes” section. These recipes are provided probably more for amusement than cooking, as even the measurements are in pounds, which was in use before the 1917 revolution. The funny thing about the recipe is that it is practically the recipe for ‘sharlotka,’ the popular Russian apple cake. The only difference I can see between ‘zapekanka’ and regular apple cake is that it is made with white bread instead of flour. Legend has it that the original German dessert was re-invented a-la russe by a French chef working for Tsar Alexander I in London. Naturally, the Soviet government couldn’t support a food with an obviously foreign name, and called it “zapekanka” or “apple babka” instead. What’s curious is that they didn’t even include it in the main section of the book, but only left it on the side as a historic relic. Growing up, we had sharlotka all the time — and called it that, too, although we often made it with real dough instead of bread. I don’t think it was a relic in the Soviet times either. I suspect she didn’t necessarily ask them if they would like the recipe either! I’m so grateful word of mouth saved sharlotka from oblivion — even if its name was changed. Another interesting thing that Granny shared was that a lot of the recipes from the pre-revolution go-to cookbook by Elena Molokhovets were used in the Soviet book under different names and with the modern measuring scale. Obviously, it wasn’t talked about. Sharlotka’s journey to my table was a long historic one, but I tell you it was very well worth it! Mix eggs and milk together. Soak the bread in the milk and egg mixture. Slice the apples and mix them with sugar. Grease the bottom and sides of a baking dish. Sprinkle with breadcrumbs. Lay the soaked bread pieces in the pan, then lay apples on them. Layer the bread and apples until everything is finished. On each layer of bread, lay a piece of butter. When the pan is full, smooth the top, pour melted butter over the dish, sprinkle with powdered sugar and almonds and bake.